Visible Vowels is a web app for the analysis of acoustic vowel measurements: f0, formants and duration. The app is an useful instrument for research in phonetics, sociolinguistics, dialectology, forensic linguistics, and speech-language pathology. The program has been developed at the Fryske Akademy (Leeuwarden, The Netherlands) by Wilbert Heeringa under supervision of Hans Van de Velde. Visible Vowels is still under development. Comments are welcome and can be sent to . Visible Vowels runs best on a computer with a monitor with a minimum resolution of 1370 x 870 (width x height). The use of Mozilla Firefox as a web browser is to be preferred. The input file should be a spreadsheet that is created in Excel or LibreOffice. It should be saved as an Excel 2007/2010/2013 XML file, i.e. with extension '.xlsx'. An example is schematically shown below. The first column should contain the speaker labels. Choose 'speaker' as column name. In our example there are three speakers labeled as 'A', 'B' and 'C'. A column that contains the vowel labels should follow; for this column always choose 'vowel' as column name. In our example each of the speakers pronounced four different vowels: iː, ɛ, aː and ɔ. Although in this table each vowel occurs just one time per speaker, multiple pronunciations are possible. In case you want to use IPA characters (as in the example), enter them as Unicode characters. In order to find Unicode IPA characters, use the online IPA Chart Keyboard of Weston Ruter at http://westonruter.github.io/ipa-chart/keyboard/. N.B. : the columns 'speaker' and 'vowel' are obligatory. An arbitrary number of columns representing categorical variables such as location, language, gender, age group, etc. may follow, but is not obligatory. See to it that each categorical variable has an unique set of different values. Prevent the use of numbers, rather use meaningful codes. For example, rather then using codes '1' and '2' for a variable 'age group' use 'old' and 'young' or 'o' and 'y'. A column which contains the durations of the vowels should follow, with 'duration' as column name. The measurements may be either in seconds or milliseconds. This column is obligatory as well. Finally, a set of five columns should follow: 'time', f0', 'F1', 'F2' and 'F3'. The variable 'time' gives the time point within the vowel interval in seconds or milliseconds, i.e. it is assumed that the vowel interval starts at 0 (milli)seconds. The f0, F1, F2 and F3 should be measured at the time given in the column 'time'. The program assumes that they are measured in Hertz and not normalized. The set of five columns may be repeated as many times as the user wishes, but should occur at least one time. 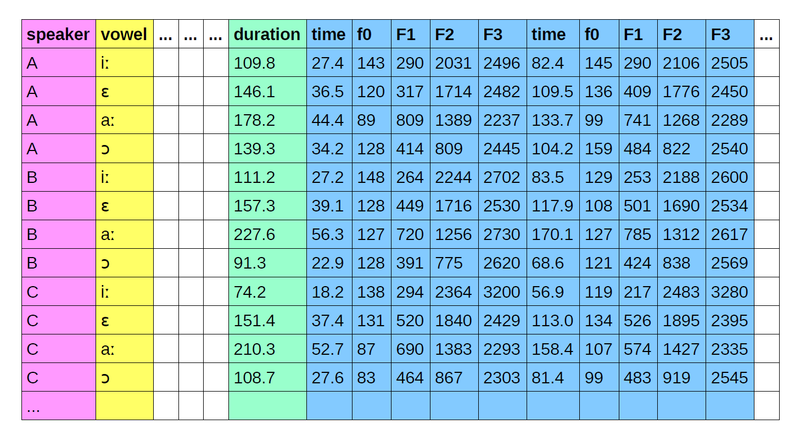 In our table f0, F1, F2 and F3 are given for two different time points, hence the set of five columns comprising 'time', 'f0', 'F1', 'F2' and 'F3' occurs twice, but may occur more often. For each repetition the same column names may be used, as was done in the example table below. In order to try Visible Vowels an example spreadsheet can be downloaded here and be loaded by this program. Visible Vowels allows to convert and normalize vowel data and calculate some specific metrics. The document here explains how these values are calculated. Heeringa, W. & Van de Velde, H. (2018). “Visible Vowels: a Tool for the Visualization of Vowel Variation.” In Proceedings CLARIN Annual Conference 2018, 8 - 10 October, Pisa, Italy. CLARIN ERIC. This app is provided 'as is' without warranty of any kind, either express or implied, including, but not limited to, the implied warranties of fitness for a purpose, or the warranty of non-infringement. Without limiting the foregoing, the Fryske Akademy makes no warranty that: 1) the app will meet your requirements, 2) the app will be uninterrupted, timely, secure or error-free, 3) the results that may be obtained from the use of the app will be effective, accurate or reliable, 4) the quality of the app will meet your expectations, 5) any errors in the app will be corrected. The app and its documentation could include technical or other mistakes, inaccuracies or typographical errors. The Fryske Akademy may make changes to the app or documentation made available on its web site. The app and its documentation may be out of date, and the Fryske Akademy makes no commitment to update such materials. The Fryske Akademy assumes no responsibility for errors or ommissions in the app or documentation available from its web site. In no event shall the Fryske Akademy be liable to you or any third parties for any special, punitive, incidental, indirect or consequential damages of any kind, or any damages whatsoever, including, without limitation, those resulting from loss of use, data or profits, whether or not the Fryske Akademy has been advised of the possibility of such damages, and on any theory of liability, arising out of or in connection with the use of this software. The use of the app is done at your own discretion and risk and with agreement that you will be solely responsible for any damage to your computer system or loss of data that results from such activities. No advice or information, whether oral or written, obtained by you from the Fryske Akademy shall create any warranty for the software. The disclaimer may be changed from time to time.